The EPIC-IP 15” is the first 15” E.P.I.C. 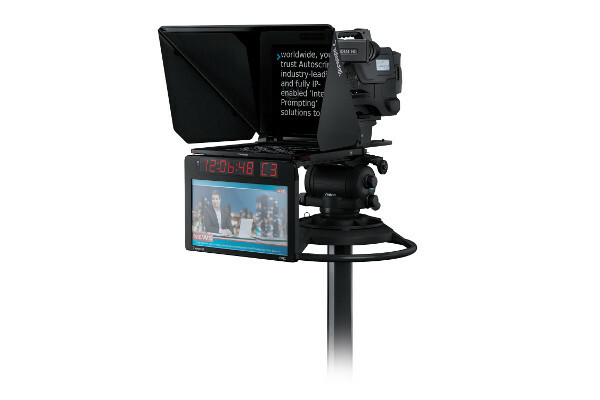 integrated teleprompter and talent monitor system. Its compact size and lighter weight make it the ideal choice even for small robotic setups. The talent monitor is mounted using friction hinges to allow easy readjustment of viewing angle, and folds under the prompt monitor when not required. The drive electronics remain integrated into the main prompt monitor, reducing the talent monitor depth, weight and power consumption. The EPIC-IP combines integrated accessories and talent monitor with high contrast, high-bright prompt monitor to create a presenter information centre that empowers clear delivery through the lens in any situation. Integrated talent monitor size: 15.6"